Pictures, historical detail, locations of thirty-one original instruments, a visit to the Silbermann Museum, Silbermann organs on CD, plus all the info you need for a Grand Organ Tour! Germany is exceptionally rich in historic organs. Try the door of any village church or city cathedral - chances are you will be rewarded with a fine historic instrument in resplendent casework. A particularly fruitful area for exploration is the state of Saxony in southeast Germany, with no fewer than thirty-one baroque instruments by Gottfried Silbermann, most of them in near-original condition. Gottfried Silbermann (1683-1753) and Johann Sebastian Bach (1685-1750) were contemporaries and worked together as colleagues and friends. Bach and Silbermann shared an interest and advanced knowledge of acoustics as applied to the voicing and location of organs. 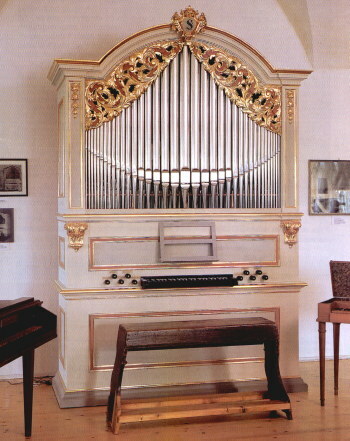 They would also work together in their latter years on the escapement mechanism for the first Fortepianos - Silbermann was to make several for Frederick the Great, and it was in trying out one of these in the Palace of Sans Souci, Potsdam, that Bach elaborated on the King's theme for the Musical Offering. Just as Bach became Honorary Court Composer at Dresden, so likewise did Gottfried Silbermann receive the title of Honorary Court and State Organ Builder to the King of Poland and Duke of Saxony at Dresden. On a personal level we may be certain that Silbermann was a frequent visitor at the Bach home in Leipzig – he was godfather to Carl Philipp Emmanuel who, like his brother Wilhelm Friedemann, held him in high regard. Gottfried's father was a craftsman-woodworker from whom no doubt the young Gottfried learned the precision woodworking, so vital to avoid any wind-leakage, which is one of the hallmarks of his instruments. From 1702 to 1707 he studied the arts of organ-building with his elder brother Andreas in Strasbourg, and for two of these years with Thiery in Paris. Andreas himself had been greatly influenced by the more "southern" ideas and sounds of the German/Italian builder Casparini, who built many fine instruments in northern Italy including Venice. Casparini's finest instrument was built in Goerlitz on the (present-day) Polish-German border from 1697-1702. It has three manuals and 56 stops including a particularly large pedal section of 21 stops. This instrument is noteworthy in the present context as Andreas Silbermann played a major role in its construction, assisting the then 80-year-old Casparini. A condition of his elder brother's tutelage was that Gottfried would not work in his brother's "territory"! So in 1710 Gottfried returned to his native Saxony and set up shop centrally in Freiberg, bringing with him qualifications and certificates which immediately established his reputation locally. His first commission was for a small, one manual and pedal, 15-stop organ for his home town of Frauenstein, which Silbermann built "at cost", waiving his personal fee and thus displaying a business sense which would become a feature of his career. So well-received was this first instrument, completed in 1711, that in the same year Freiberg Cathedral invited the young builder, then only 28 years old, to construct a new organ of three manuals and pedal with 44 registers. This was completed in 1714. Business moved briskly thereafter, and Silbermann's instruments would finally total 45, all within the relatively narrow area of Saxony. Such did his reputation grow, that Gottfried Silbermann felt confident to request an official title from Frederick I, at that time King of Poland and Duke of Saxony. His request is dated 10th June 1723 and on the 30th June he was granted the privilege he had sought: "Honorary Court and State Organ Builder to the King of Poland and Duke of Saxony". It sounds even better in Baroque German! Perhaps the single most important feature of Gottfried Silbermann's instruments is their distinctive sounds. From the silvery flutes to the strong and reedy 16' Posaune in the pedal, Silbermann's sounds were unique, and indeed were constantly praised by organists in their testimonies of his instruments. Frequent reference is made to a play on his name, as organists praised his "Silberklang" or "Silvery Sounds". Mozart was quite clear: "These instruments are magnificent beyond measure". Arp Schnitger is another of Germany's famous builders, working mainly in north Germany and Holland. Comparison between these two builders reveals major differences largely brought about by the Silbermann brothers' exposure to French and Italian concepts, to which Gottfried added his own ideas based on his (for the time) extensive knowledge of chemistry and physics. Thus in comparison to the work of Arp Schnitger for example, Gottfried Silbermann used larger proportions of tin in the pipe-metal and the tone of the pipes was thus brighter; the cornets made from ranks of pipes in harmonic series gave a striking reed imitation; and the general treatment of the tone mass in a Silbermann organ was more powerful and smooth than that of Schnitger's organs. Silbermann was well-versed in the science of acoustics, and his instruments were carefully sited for maximum acoustical effect in each individual church. On first examination it would appear that many of Silbermann's smaller instruments are identical, and indeed they are both in appearance and specification. Deeper analysis however reveals major differences in final voicing and tuning, reflecting precisely the acoustical characteristics of each individual location. Gottfried also enjoyed an excellent appreciation and knowledge of music, which was essential if his instruments were to express with clarity the (largely contrapuntal) music of the time. J.S. Bach is known through contemporary comments to have himself been expert in organ construction, and the two no doubt exchanged ideas. With his instruments gathered relatively closely together within or very close to the Saxon borders, Silbermann thus minimized the transportation costs for his materials. For the organ-lover today, this close proximity of so many single-builder instruments of such fine quality makes a Gottfried Silbermann Organ Tour imperative and richly rewarding. 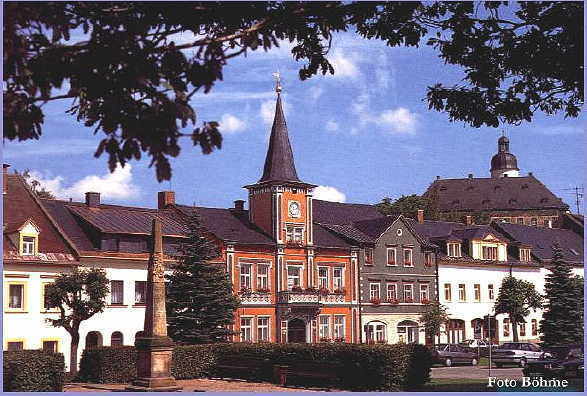 Why not begin our tour in the picturesque little town of Frauenstein; it is close to the village of Kleinbobritzsch where Silbermann was born and indeed the young Gottfried went to school in Frauenstein. The town is also the location of Silbermann's first instrument (regrettably lost in a fire only a few years after its construction), and is centrally located in the heart of "Silbermann territory". Most importantly, Frauenstein is home to the Gottfried Silbermann Museum, the only museum dedicated to one builder. The Museum is located in the fine medieval castle just above the town (on the right in the picture), dating from 1585-1588. The Museum was founded in 1983 by, and based on the research of, Werner Müller (1924-1999) whose two books are the definitive reference works on the life and work of Gottfried Silbermann. The opening of the Museum coincided with and celebrated the 300th Anniversary of Silbermann's birth. As an "introduction" to Silbermann's work, beautiful, large-format photos illustrating every extant Gottfried Silbermann organ are hung around the walls of the museum's foyer. The Museum contains numerous valuable and original documents of specifications, contracts and letters pertaining to Silbermann's life and his various commissions. 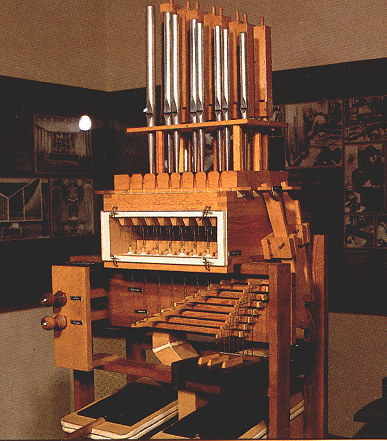 A full-size working exhibit by Jehmlich organ-builders of Dresden shows simply and clearly the operation of an organ from bellows through the action of stops and keys, to the pipes. In pride of place is a beautiful single manual instrument built in 1993 by Wegscheider of Dresden. 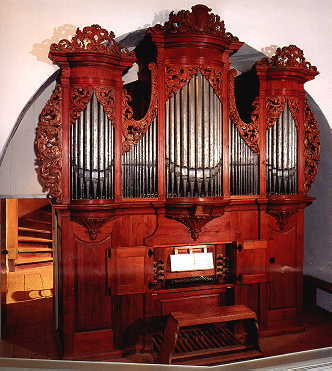 It is an exact copy of an extant Silbermann organ dating from 1732. Recitals are given regularly on this beautiful little instrument which produces the "Silbermann Sounds" with remarkable accuracy and resonates particularly well in the vaulted Museum. Peter Kleinert, organist at Frauenstein, demonstrates this instrument on a CD available at the museum. For full address and opening times of this unique museum, see below. Following our visit to the museum, we can embark on a village-organ tour, perhaps enquiring through Frau Müller, the museum's curator, whether the churches will be open and the organist practising (it's a small and friendly local community and "things can be arranged" for those of serious intent!). The village of NASSAU is just a short 6km down Route 171 south of Frauenstein - take a Right to the village and church. Organ: 1748. 2M+P/19. Very good, original condition largely preserved. 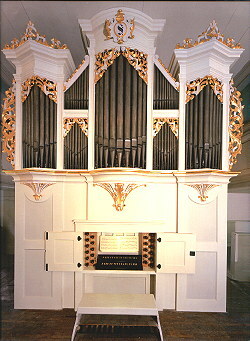 Recent full restoration by Jehmlich, the Dresden organbuilders. Nassau is a sub-district of Frauenstein. For church opening times, concerts and organ recitals etc enquire at the Museum in Frauenstein. Visit the church and organ. Moving a little further afield, the village of Helbigsdorf has an instrument in fine condition, of typical Silbermann design and construction (below left). The photo at right shows the little single manual organ at Dittersbach southeast of Dresden. Our final place of pilgrimage must be Freiberg, original location of Silbermann's workshops, and home today to four Silbermann organs in three churches. In the Jakobi-Kirche a two-manual, 20-register organ built in 1718; in the Petrikirche a larger, two manual organ with 32 registers built in 1735; and in the cathedral, two Silbermann instruments. The smaller is a one-manual instrument, originally built for the Johannis-Kirche and moved to the cathedral in 1939. The larger of the cathedral's organs must surely rank as one of the world's finest: the three-manual, 44-register instrument illustrated at the top of this page. Amazingly perhaps, this magnificent instrument was only Silbermann's second work, built between 1711 and 1714. In 1736, Silbermann built a fine 3-manual, 43-stop instrument for the Frauenkirche, Dresden. The organ was dedicated on Sunday November 25. A week later, on December 1st, as the Dresdner Nachrichten reported, "the famous Capellmeister to the Prince of Saxe-Weissenfels and Director Musices at Leipzig, Mr. Johann Sebastian Bach, made himself heard from 2 to 4 o'clock on the new organ in the church of Our Lady, in the presence of the Russian Ambassador, Von Keyserlingk, and many Persons of Rank, also a large attendance of other persons and artists, with particular admiration, wherefore also His Royal Majesty most graciously named the same, because of his great ability in composing, to be His Majesty's Composer". Tragically, the Frauenkirche with its Silbermann organ was completely destroyed during the second world war. Gottfried Silbermann's last, and largest work was his 3-manual, 47-stop instrument for the Katholische Hofkirche, now renamed Trinity Cathedral, in Dresden. However Silbermann died during its construction, and the work was completed by apprentices, so the all-important final voicing, in which process Silbermann excelled, was not completed by the master. 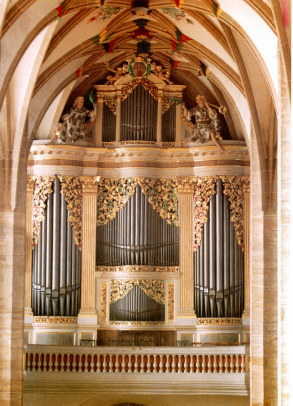 However, his many wonderful village organs, and the great Silbermann organ in Freiberg Cathedral remain as a lasting tribute to this Master Organ-Builder of the German Baroque, whose fame had spread during his lifetime well beyond his native Saxony, and whose "Silver Sounds" would be acclaimed by famous composers and musicians long after his death. Open daily from 9am to 5pm May to October. Winter hours: 9-12 and 1-4pm weekdays, 10-12 and 1-4 at weekends. Gottfried-Silbermann Gesellschaft e.V., Obermarkt 16, 09599 FREIBERG/Sa. The Silbermann Society welcomes organists and "organ-friends" to its membership. Contact the society for details, lists of publications, etc. 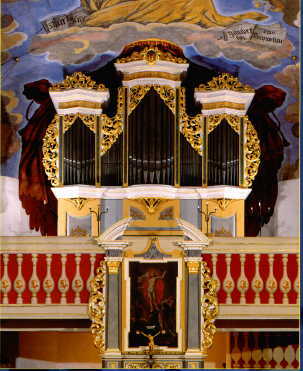 The Society organizes concerts and recitals on local Silbermann organs and a Silbermann Organ Festival is held every two years in September. Frauenstein is a small town offering a peaceful and picturesque environment. It is handy for the Museum and centrally placed for many of the Silbermann village organs. We have several suggestions for you! First and foremost: you have to hear the legendary "Silver Sounds" for yourself! The Baroque Music Club has an (almost!) complete set of Bach's Organ Works. The majority are performed on Silbermann Organs as a set of Six CDs. Some aditional performances on the pedal-harpsichord - check their Complete BWV Listing of Bach's Organ Works with links to their own recordings. Available direct through the internet. offers a chronological listing of organs built with notes on current status. gives space to every Silbermann organ location with photo, how-to-get-there, concert and recital details etc... in fact all you need to plan a real - or a virtual! - Silbermann Organ Tour. History, full specification, photos of this historic organ, still in original condition. has much experience with the restoration of Silbermann organs. also has much experience with Silbermann restoration. In 1736 Silbermann built a magnificent 3M+P/43 organ for Dresden's Frauenkirche. In 1945 organ and church were completely destroyed. The Frauenkirche lay in ruins until 1994; a grand program of rebuilding was undertaken and is now complete. on behalf of the Gottfried Silbermann Museum, Frauenstein.